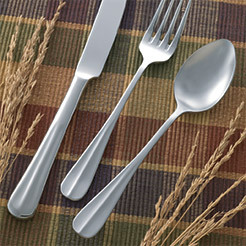 Splendids has a fantastic selection of flatware to compliment all styles of dinnerware while being dishwasher safe. 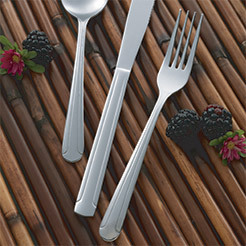 Our sturdy 18/10 stainless steel silverware offers durability and balance with protection against rust and corrosion. Our dinner utensils come in classic designs including the divided teardrop baguette, traditional and versitile dominion, and simple elegance of windsor. 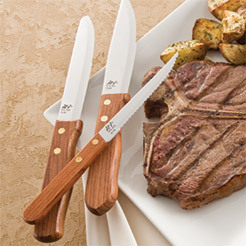 If you are in the market for high quality cutlery, our International Tableware steak knives feature solid Rosewood, ABS and POM handles. 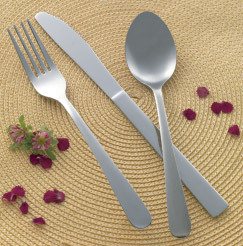 No place setting is complete without beautiful flatware. So whether you are looking to supply a restaurant, or set a single table, we have the perfect tableware to match your style.